In my one hand is a Kleenex® and in my purse is a more solid supply of Kleenex® and just that simple holding of a Kleenex® reminds me of my desire to show someone that I care. Standing in a funeral home, with one hand on a Kleenex® is a true reminder that with loss comes grief, with grief comes remembrance and with remembrance comes love, compassion and survival. The person who suffers the greatest loss is the person who is has directly suffered the loss and there is no way to fill in that deep dark void they are feeling. The survivor, submerged in a dark, gloomy abyss needs to be brought above the sinking feeling, cherished, celebrated and most of all made to feel well. This is my story of How To Spread Cheer Not Viruses. While there is nothing we can do to bring back the lost person in their lives we can bring about a way to sprinkle some cheer into their lives through the little things. Odd as it may be to start off a story for all of you with loss, grief and cheer all in the same paragraph, I can tell you that the use of a simple Kleenex® is that defining moment that reminded me to lavishly live life out loud. This is my story of how to do something easy by reaching out, remembering and helping to let the sad moments pass while remembering that all the small things count. The day was my birthday, and it was just a few years back, my Mother-In-Law passed away, it has been and always will be a crushing blow stays with me year-after-year. While the loss was hardly mine alone, my Father-in-Law was suddenly just as much on his own. As you know, if you have read other parts of my blog my Mother-in-law was my buddy, we shopped together, hung out, and my parents got along with my in-laws so well, it was just a great situation and I was blessed. When we would shop together, my mother-in-law would purchase a particular pocket candy for my Father-In-Law and I would always see him taking one piece out of these. This was her special way of reminding him that she cared and she NEVER forgot to buy those for him, each week. When she passed, he has taken on a new lifestyle and of course, he does not buy himself treats, he just buys the necessities and moves on with it. I thought back to holding that Kleenex® in my hand and the sully feelings that took me over and I just wanted to make bring a little cheer back into his life with remembrance. That was it, the defining moment, I began buying him the little packs of candy and sending it over to him and thereupon his face was a smile, a reaffirmation that he is special and loved! That is how I spread cheer not tears. While my story is a bit bleak and dismal in tone, your way to Spread Holiday Cheer year round can be done differently and your gestures of care will show someone how important they are in your life! What brought on this story today? 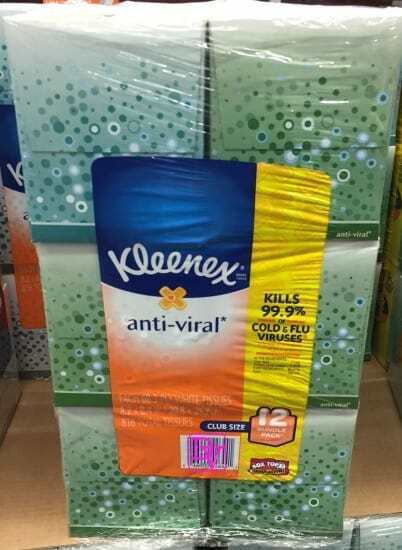 Well, I was shopping in Sam’s Club the other day and I found that there were Kleenex® Anti-Viral* In Sam’s Club-sized packs. Knowing darn well right that when our family gets together at the holidays tears still flow as we tell stories, and I also thought about the impending cold and flu season that whisks in with this holiday of spreading colds and virus. I knew that the Kleenex® Anti-Viral* Tissues boxes are available in a variety of styles and designs to accent every room décor making it perfect to mesh with decor. Wanting to spread cheer, of course we will tell favored stories, that will also bring tears, but wiping those tears away is most important, more importantly being able to blow potentially viral germs into a tissue, rather than on a sleeve or other surface. Who knows who is sick and why worry about it, let the The Kleenex® Anti-Viral* Tissues wipe away the worry. Kleenex® Anti-Viral* Tissues offer three soft layers and even have a moisture-activated middle layer that will kill 99.9% of cold and flu viruses! I am making sure we don’t pass the germs around when we blow, cry and wipe. You always have the chance to reach out and do something nice for someone, never miss the chance to be kind, spread cheer and show you care because kindness defines a person. As friends and family visit, you know that someone always has the sniffles, but don’t just hand them a tissue, hand them a Kleenex® Lotion facial tissues featuring 3-ply construction for thickness and absorbency, and Aloe Vera and Vitamin E so that the touch is soft against their face. Provide comfort and again, you are spreading the cheer, and your gesture of care with a soft, indulgent tissue let’s them cradle their nose in kindness! 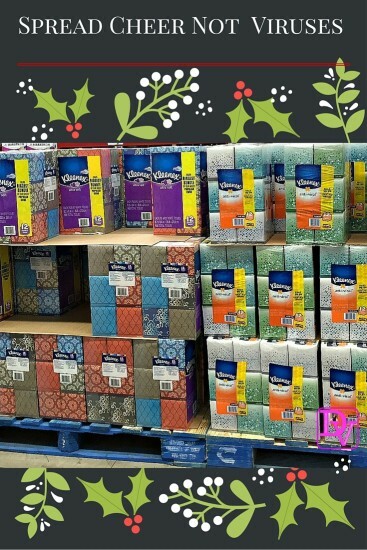 Find Kleenex®, Kleenex Winter Packs at Sam’s Club. That is my story of how To Spread Cheers Not Viruses, how do you spread cheer? That’s so sweet that you buy treats for your in-law. I’m sure it makes him feel loved. I would love getting boxes of Kleenex during the winter season as a kind gesture. Just used some today. This is the time of the year that tissue paper is necessarily. I personally use Kleenex too trusted brand ever. Such a sweet post. I’m glad you had such a special relationship with your mother-in-law, those are rare! This post was also a good reminder on how I can be looking for the little ways to show someone I care! I agree you should always reach out to be nice to someone. Love the Kleenex brand, I’ll have to pick up those anti-viral tissues! I always make sure to stock up on this. It’s easy to spread the virus, so I do my best to prevent them from spreading. I love Kleenex they have tissues for every situation you may need them and they are always soft! I’m so happy I don’t work with the public now! I used to have a permanent cold all winter when I did! I always have a box of tissue in the bathrooms and in the living room. I also make sure the kids are always washing their hands. Never heard of these tissues before. Will check locally, sure they must be available. Thanks for bringing it to my attention in such a lovely way. who want’s virus and health problems, it’s always good to be safe. This is must have in every house! We always have a kleenex in our home and wherever were go. Lexie Lane recently posted..Could Fights Between Parents Create Troubled Teens? I’ll have to get these to prevent the colds traveling all through the family like they did earlier this fall. I love Kleenex brand in general. Kleenex is one of my favorite brands. I make sure I have a box at home and in the car and a pack of it in my bag! I like this campaign of theirs. My boys have the sniffles. Time to stock up on tissues. This is the worst time of year. I hate feeling like I shouldn’t be near people but everyone is HACKING and you can’t tell if they’re sick or have allergies. It’s awful. Spread the cheer great story especially at this time of the year a season filled with joy and sadness. Kindness and gratitude goes hand in hand. I like the way you use a tissue as a symbol of sharing ones love and compassion to care for others who is in need. I love this we need to protect ourselves against viruses!